The Spanish Golden Visa programme has experienced its most successful year on record according to the latest government figures. Since starting in 2013, the programme has raised almost 3 billion euros and shown an approximate growth of 45% year on year. Whilst the minimum investment required is just €500.000,00 the average investment being made by real estate buyers has been around €740,000. This reflects the fact that many applicants treat Spain as a residence and choose to invest for a home rather than simply investing at the €500.000,00 Golden Visa qualifying limit. Barcelona has proven to be the most popular city for investors whilst many are investing in coastal regions such as the Costa del Sol, Balearic and Canary Islands and the Costa Blanca. For those looking for a lifestyle property, these coastal areas prove to be much more costs effective. 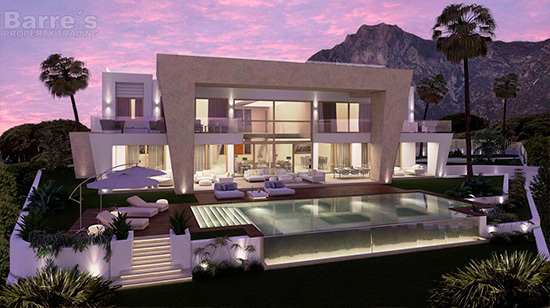 In locations such as Alicante, Costa Blanca south, investors can expect to find a brand new contemporary villa with a private pool for around €500.000,00 or just above. City investment are great for rental return but price per square meter comes at a much higher cost. Not only is the Golden Visa Programme thriving, the property market as a whole has been showing significant sings of growth over the last few years. In 2018 the market showed a 6.2% annual increase in property prices according to the registered housing databases provided by the General Council of Spanish Public Notaries. Travel freely within the Schengen Area. Allows the permit request for the family: spouse and children under 18 years of age. Enjoy a residence in a European country, with a great appeal, stability, security and quality of life. The holders of a Spanish Residence Permit / Golden Visa will not require a visa to enter the Europe Schengen area. They can transit and enjoy free movement in the Schengen area for a maximum period of three months (90 days) per half-year from the date of first entry. - Purchase of Spanish real estate of at least 500.000 €; Investment in multiple properties and co-owner ship allowed. - Capital transfer of at least 1.0 Mn € into the Banking System or Spanish Companies to be invested in any type of business or company. - Creation of a Business Venture leading to job creation, local economic development or scientific/technological innovation Investment in Spanish Debt Bonds of at least 2.0 Mn €. - Major shareholders of foreign companies who invest in Spain may individually obtain the Golden Visa. - The investment activity must be performed before the application and maintained for a minimum period of 5 years after the residence permit is granted. - The temporary residence permit is then renewed for 2 successive periods of two years, provided that the requirements of the investment activity are maintained. - There is currently no minimum stay period in Spanish territory, but the holder of the Spain Residence Permit must travel at least once to Spain, during the period preceding each renewal. - The holders of the Spain Residence Permit will not have permission to work in Spanish territory. - The holders of a Spain Residence Permit may apply for family reunification and may gain access to a permanent residence permit and also to Spanish citizenship, in accordance to the legal provisions. - Applications from individuals with criminal record will be rejected. - The decision to grant a Spain Residence Permit must be taken by the competent authorities within 20 days after the submission of the application, which must include evidence that the financial or real estate investment has already been completed. Golden Visa, directed at the foreign investment market with special advantages for the real estate investor and for non-European businessmen who are able to invest in the country a minimum of 500.000,00 Euros. The law 14/2013, of the 27nd of September, supporting enterprising and its internationalization, introduces a new type of visa and residence permit in Spain for investors known as Golden Visa. The main target of this measure is to facilitate foreign investments in Spain made by foreigners who are not citizens of the European Union, through an agile and flexible method focused on those who have the consideration of investors in his legal concept, enterprising, high qualified professionals or workers who execute transactions within the same company. • A new type of visa which allows entering and staying in Spain for a period of 1 year, increasing the actual period of 90 days for non-residents. • Allows to circulate freely and without restrictions in the ‘Schengen area’ (Spain, France, Germany, Austria, Belgium, Denmark, Estonia, Finland, Greece, Hungary, Iceland, Italy, Latvia, Lithuania, Czech Republic, Liechtenstein, Luxemburg, Malta, Netherlands, Norway, Poland, Portugal, Slovenia, Slovakia, Sweden and Switzerland). • A new type of residence permit, which can be requested at the end of the visa, and which is valid for two years renewable for a further period of two years. • Does not entail a minimum period of residence in Spain of 183 days for its renovation (the beneficiary can keep his tax address out of Spain). • Together with the investor, his family: spouse and children under 18 years of age or dependent adults due to health reasons, can request the visa. • Not having entered o stayed illegally in Spanish territory. • Not having criminal records in Spain and in the countries where the petitioner has lived during the last 5 years due to crimes provided by the Spanish legal system. • Not appear as refused in any country which has a valid agreement with Spain in this sense. • Have a health insurance with an authorized entity to operate in Spain. • Have sufficient economic resources for the person and for the members of his family during his residence period in Spain. • Be a holder of a valid investor’s visa or being within the period of 90 calendar days subsequent to its expiration. • Having visited at least once Spain during the applicability period of the visa. • Pay the tax for the authorization process. • Submission of certificate including the continuous information of the possession and charges of the Land Registry Office corresponding to the property or properties. • Investment of 500.000 euros free of charges and encumbrances. • Submission of certificate issued by the financial entity or Banco de España where it states that the petitioner is the sole holder of the investment for a period of 5 years or more. • Copy of the investment statement carried out in the Registry of Foreign Investment of the Ministry of Economy and Competitiveness, in case of not valued social shares investment. • Certificate of the intermediary financier, duly registered by the National Commission of the Securities Market or by the Banco de España where its states that the petitioner has carried out the investment, in case of not valued shares investment. • Certificate issued by the financial entity or the Banco de España where it states that the petitioner is the sole holder of the investment for a period of 5 years or more, in case of public debt investment. • Business activity / Enterprising: Favorable report to confirm that in the submitted business project, reasons of general or economical interest for Spain concur. This report will be issued by the Economical and Commercial Office corresponding to the geographic area where the petitioner submits the visa application. • High qualified professionals / Transactions within the same company: The Company has to carry out a previous process of residence authorization in Spain for high qualified professionals, which will be issued by the Big Companies and Strategic Group Unit, being subject to its acceptance by the General Management of Migration. • What is a Golden Visa in Spain? • It is a new type of residence visa, established by the Law 14/2013, of the 27thof September, aimed at those non-resident foreigners who want to enter the Spanish territory in order to carry out a significant capital investment. • Which are the types of Golden Visa in Spain? • The law distinguishes two big groups. The capital investments (in public debt, social shares of Spanish companies, bank deposits in Spanish financial entities and through the acquisition of real estate assets) and other kind of investments (creation of a company of general interest, high qualified professionals and transactions within the same company). • Does the golden visa authorize me to circulate freely within the Schengen area? • Yes. The investor’s visa authorizes to circulate freely within the “Schengen” area (Spain, France, Germany, Austria, Belgium, Denmark, Estonia, Finland, Greece, Hungary, Iceland, Italy, Latvia, Lithuania, Czech Republic, Liechtenstein, Luxemburg, Malta, Netherlands, Norway, Poland, Portugal, Slovenia, Slovakia, Sweden and Switzerland). • Can I keep my tax residence outside Spain? • Yes. The holder of the permit can keep his tax residence outside Spain, as long as he stays in our country for a period less than 183 days per year. Also, the residence permit can be renewed even with absences longer than six months per year. • How long can I stay in Spain with my Golden Visa? • The residence visa for investors authorizes to stay in Spain during one year. Once this period is expired, a residence authorization can be requested for a period of two years, renewable for two more years if you prove the maintenance of the investment. • Does the golden visa authorize me to work? • Yes. The Golden Visa authorizes to live and work in Spain. This results from the Fourth Additional Provision of the Law, which states a single proceeding to request a permit authorizing to live and work. • Does the proceeding to obtain the residence be reduced? • Yes. The visa applications will be solved and notified in a period of ten working days, while the maximum period to solve the residence authorizations are 20 days since the submission of the application, with a positive administrative silence. • The 500.000 Euros are per petitioner or per application? • Per petitioner, but he can also include his companion relatives, who can jointly and simultaneously or successively request the authorization and, in case, the visa. Nevertheless, they have to fulfil the general requirements and prove the relationship bond through their corresponding certificates. • Who have the consideration of companion relatives in order to request the investor visa? • The position as relatives will be considered for the spouse and children less than 18 years or of legal age that are not objectively able to provide their own necessities due to their health condition. • Can I buy more than one property? • Yes. The reference of real estate assets made by the law does not mean only one property, and not only one type of property. In any case, the investment has to be carried out before requesting the visa. • Should the investment be carried out free of charges and encumbrances? • Yes. In the assumption of acquisition of real estate assets, the petitioner should prove his capacity of carrying out an investment of 500.000 Euros free of any charge and encumbrance. Nevertheless, the amount that exceeds for the required figure can be subject to charges or encumbrances. • At the termination of the maximum period of five years, can I request the long-term residence? • It can be requested but will not be granted automatically at the termination of the investors permit. In this case, the continuity of the residence in Spain should be proven for the acquisition of the long-term residence. • What requirements do I have to comply to access the long-term residency? • In order to access the long-term residency, it is required that the person from abroad has lived legal and effectively in Spain for five years. That the residency is effective means that the periods lived out of Spanish Territory must be less than six consecutive months and not exceed a total of ten months during the said five years. • Does the time period of legal residency in Spain count at the time of requesting the nationality? • Yes. The time lived in Spain legally will count to request the long-term residency and also the nationality. • Can I opt to continue renovating the residence permit for each investor every two years indefinitely? • Yes, however with certain clarifications. The residence authorization for investors must have an initial duration of two years, after which the permit can be renovated every two years indefinitely in the case that the investment and the rest of requirements are complied. • Can I access directly to the residence authorization for two years without having to obtain an investors authorization? • No, it is necessary to have the investors authorization which is valid for one year. During this year, the residence authorization can de requested at any moment without having to wait to complete the year. • Does the Law 14/2004, of the 27th September have retroactive character? • No. The Law is only applicable to the investments carried out from the 29thSeptember 2013 onwards, date when the law entered into force, as it is states in the thirteenth final disposition of the same. We guarantee residence permit Golden Visa. With our service Pre-Golden Visa, you should learn in advance if your residence is going to be granted before investing. We are a Real Estate company in Spain, that offers a service that lets you know if a client is going to obtain or not Golden Visa in Spain without having to buy a property, without having to invest 500.000 Euros, without risk. Through this service, we prepare all necessary documentation, we revise and check with government agencies looking for any kind of error o problem. If everything is in order, we issue a report that certifies if Golden Visa is going to be obtained or not. You Insure your Object (La Golden Visa) before investing 500.000 Euros. In Spain they refused already 14 applications with investment already made. In those cases, client, not only that doesn´t obtain La Golden Visa but also doesn´t recover all expenses paid, for example tax. With our service Pre-Golden Visa, your investment is assured at the beginning of the path. We offer the complete solution to the investment process required in order to obtain the Golden Visa in Spain. In a strict and confidential manner, let us accompany, assist and advise you on all legal aspects of investment, supervising all the requirements throughout the entire process. We take care of all the legal administration, drafting contracts, registration of deeds, completion of the application forms for residency, obtain tax identification numbers, police assistance, embassies, consulates, etc. Our integrate service ensures success and guaranteed the client satisfaction.